! "AINHOA" ES PREMIADO EN BEIRUT, LIBANO!
! "AINHOA" ha recibido el premio "BEST CINEMATOGRAPHY" (Jose Martín Rosete) en el "Baalbeck's International Film Festival 2018", Beirut. LIBANO!
! "AINHOA" alcanza los 103 Premios Internacionales! 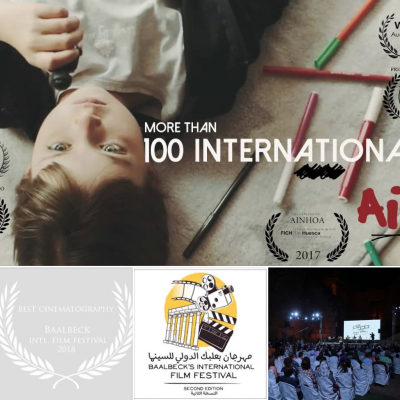 -WINNER "AINHOA" - Short Film" by Ivan Sainz-Pardo has won AWARD N° 103: "BEST CINEMATOGRAPHY" (Jose Martín Rosete) en el "Baalbeck's International Film Festival 2018", Beirut. LIBANON! "AINHOA" has won already 103 International Awards!